Caption Coyolxauhqui: the Aztec Moon goddess Her name means "Golden Bells." . The daughter of the Earth goddess Coatlicue and the sister of the Aztec Sun god Huitzilopochtli. Coyolxauhqui encouraged her four hundred sisters and brothers to kill their dishonored mother. Coatlicue gave birth to Huitzilopochtli after a ball of feathers fell into the temple where she was sweeping and touched her. Huitzilopochtli sprang out of his mother as an adult fully armed and saver her. Coatlicue regretted such violence. Thus Huitzilopochtli cut off Coyolxauhqui's head and threw it into the sky to form the Moon. 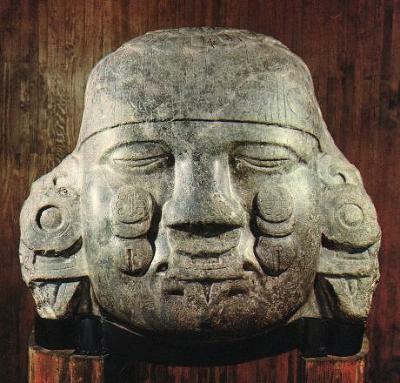 "The Coyolxauhqui Stone " a giant monolith found at the Great Temple of Tenochtitlan. ... The Coyolxauhqui. ... Stone was discovered in the heart of Mexico City on February 21 1978 It was located at the base of the stairway of the Templo Mayor on the Huitzilopochtli side of the temple.